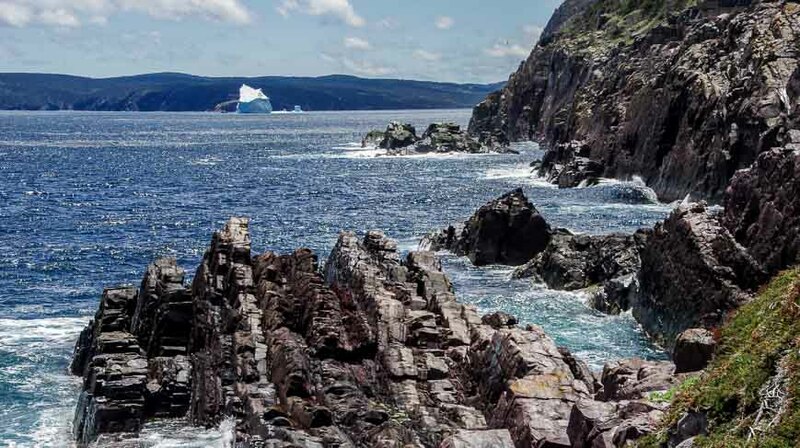 You are in for a treat should you be lucky enough to hike the Sugarloaf Path – an 8.9 kilometre section of the East Coast Trail near St. John’s Newfoundland. The East Coast Trail, if you’ve never heard of it, runs for 265 kilometres along the eastern coast of Newfoundland from Cape St. Francis in the north to Cappahayden in the south. Some people hike the whole trail over 10-14 days but many people – especially local people aim to hike the whole trail over the course of a summer or even years by hiking it section by section. I managed to do a couple of sections of the trail over a few days while based in St. John’s. The Sugarloaf Path starts at the Ocean Sciences Center in Logy Bay – just a 10 to 15 minute drive from downtown St. John’s so it’s easily accessible by taxi as a one way day trip from the city. This section of the trail is a standout for coastal scenery from start to finish, and even more so when I was there since there were a couple of icebergs floating just outside of St. John’s Harbour. The trail is rated as difficult by the East Coast Trail Association because of more than 150 metres of elevation gain. I would call it a moderate hike based on what I normally do. They suggest allowing 3 – 5 hours to complete the hike which when reading the description seemed excessive. The path has its fair share of ups and downs so paying attention to your footing is important. And if you have any interest in photography or flora then there are plenty of reasons to stop – and just stare out to sea. We were in Quidi Vidi Village approximately four hours after starting with a nice long break for lunch. The trail is extremely well marked and the only negative is the fact that you must pass close to the Robin Hood Bay Sanitary Landfill – the city dump. There is no smell but there is a bit of wind blown garbage which volunteers try to clean up regularly. To return to St. John’s from Quidi Vidi Village we had a couple of options. Hitchhike, take Metro bus 15 that operates about every 30 minutes, seven days a week or walk back. We chose to walk back and I’m so glad we did. It took about an hour and added about four kilometres to the day. Simply walk up Stone Road, accessed from the road to the Quidi Vidi Brewing Company (it won’t take you long to figure that out). Look for the sign saying Cuckold Cove Trail and follow it up. In about 20 minutes you’ll arrive at the top of Signal Hill. But before arriving, you’ll pass by a massive bald eagle’s nest with two babies that are now six weeks old. There’s one photographer – Wayne Norman – who has been documenting their lives since hatching. Check him out on Flickr. After admiring the views from the top of Signal Hill we wandered down the road and walked right to our B&B. Have you hiked any sections of the East Coast Trail? Gorgeous photos, Leigh! I need to return to St.John’s to spend more time – we hit the main attractions in a couple of days but didn’t have time for any experiences such as this. I definitely want to go back during iceberg season! @Lisa I met one woman who was visiting St. John’s for the 3rd year in a row but it was the first time for her this year that she saw icebergs so I feel like we got very lucky. Wow, Leigh! This is a beautiful place! Makes me recall the icebergs off the tip of Newfoundland we saw on our parting morning! Fantastic! @Sandy You would love this hike. It’s so beautiful and the icebergs were such a bonus. Yesterday we saw lots of icebergs in Bonaventure. @Mike Even for non-hikers I don’t know how you couldn’t be blown away by the beauty of this trail. It was one section that was suggested to me and I’m so thankful it was. And seeing icebergs is always a thrill. Lovely scenery, Leigh, and those village shots are so nice. Looks really picturesque. Would love to go there one day. @Andrew We were truly thrilled with the scenery we encountered on that section of the East Coast Trail. We had smiles on our face from start the to the finish. Wow! Stunning scenery! So cool to see those floating icebergs… It’s nice that you can do shorter or long sections of this hike. @Janice This section of the East Coast Trail was memorable and one I’d recommend to anyone heading to St. John’s. Exploring and soaking in all the nature and gorgeous landscapes I’m sure makes the hiking more enjoyable. @Rachel It was truly a fantastic day and I wish all my days were like this one. I’ve been enjoying your Facebook photos of the icebergs and kayaking, so I just had to read this post. Looks like a beautiful hike. It’s rather thoughtful of someone to build those stairs. Some of my friends moved from Penang to St. John’s last year, so it’s also nice to see through you what their new home is like. Cold compared to tropical Malaysia! Astonishing to see icebergs floating that close to the coastline. I have always wanted to see one. One day I must take a trip that includes the opportunity to see icebergs. @Jenny Timing is everything when it comes to icebergs so plan for late June as that’s the peak. And go to Twillingate for some very close encounters. Hi Hike Bike Travel, do you know where we can buy the maps for the East-Coast Trail? We are leaving Saturday and we are too late to order it. Can we buy those maps in St-John? @Pascal I do not but once you’re in St. John’s I’d head for a sports store OR email the contact on the ECT to find out or phone 709-738-HIKE. Have a great time. Thank you for your awesome post. We did the Sugarloaf trail in October and it was fabulous!! Hiked 3 days on the ECT and all of it was amazing – love your blog!! @Sarah And I love your comment. I would like to one day hike the whole of the ECT. I done his hike and it is INCREDIBLE! Love, love, love the East Coast Trail! @Mandy I would love to do the entire ECT in one trip – one day.